I read this article and found it very interesting, thought it might be something for you. The article is called October 2014 – Monthly Income Report and is located at http://www.onehourprofessor.com/october-2014-monthly-income-report/. Well, it’s been a heck of a month. I experienced my first techpocalypse, opened a few more revenue streams, wrote my first guest blog post, outsourced a ton of work, and continued working on my free internet marketing 101 course which you can access here. If this is your first time on my website, let me explain why I write a very detailed income report each month that outlines the money I made (or lost) and the time I spent working each month. Truth be told, I spent a lot of time working this month, but I feel like I could have done more. This really was a difficult month because I had a lot of issues from a technology standpoint which I mentioned in a blog post. 1) I took some time this month to create a strategy for Twitter that should allow me to more easily focus on building relationships with other individuals in my industry through social media. I tasked my virtual assistant with finding the number of Twitter followers for a specific list of people that I would like to become acquainted with over the next year. From there, I looked at all of the numbers that my virtual assistant gathered and created four different tiers that demonstrates the social influence of each of these people by their number of followers. Then, I created Twitter lists with all of these people in them in their respective tier and for now I am focused on gaining the attention of those with the lowest social followings and I’ll go for the most popular tier once I’ve exhausted my options. 2) Another big focus this month was the Internet marketing 101 course redesign. I spent a significant amount of time working on a video quick tip which explains what SEO is and how it works. That particular video took a ton of time to create and I’m happy that I was able to get it done because I did a lot of research to understand SEO on a very detailed level. If you aren’t very well acquainted with SEO and how it can benefit your website, I highly recommend you check out the quick tip. The amount of outsourced time on that course for this month was 14 hours which was pretty much all focused on somebody editing it. This may seem like a lot of time to you, but there have been numerous instances when I’ve spent entire hour trying to edit five minutes of video because of how particular I am. 3) The last big project that took up a lot of time this month was niche website #1. You’ll see that I spent a total of seven hours, most of which was editing the content that was given to me by my writer, but nonetheless it took a significant amount time. I focused a lot on the niche website this month simply because I realize that in order to make money in the short term to keep the OneHourProfessor.com website going, I need to find a way of bringing in a steady stream of income. I know that OneHourProfessor is going to eventually be a great resource for many people to learn how to create and market online businesses to earn extra cash, but this website is more of a long-term vision. I want to try to find a way to make cash in the shorter term and I really have confidence in my niche website because I found a great writer and it’s coming together much more quickly than I anticipated As you can see in the report, I outsourced 18 hours to the writer this month alone and now all I have to do is finalize the homepage and recommended resources to be able to launch. I plan on having my writer continue to create one to two blog posts per week after the site is launched, but the first step is getting the actual content of the website all figured out and we are almost there. I can’t wait for the day where I can make a positive meme, but for now I suppose we have to have another month of this. 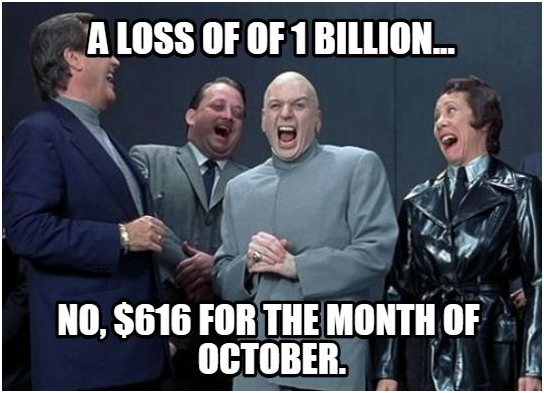 Yep, I lost a total of $616 in October. I explained this to some friends and their eyes bulged out of their heads when I told them this. That’s a legitimate question, but one of the things that I need to do because I have a full-time job is focus on delegating my work to outsourcers in order to get things done. Sure, if I had all the time the world and absolutely no bills, I’d be able to do all the stuff by myself and probably do a better job than my outsourcers do in the first place, but ain’t nobody got time for dat. Another thing to keep in mind is that I’m not actually “losing” any money. A lot of the money I spent this month was focused on investing in future projects/current projects to improve them and get them ready for launch. With all that being said, if you take a step back and really look at what I was able to get done this month is pretty incredible. I was able to outsource a total of 59 hours and 15 minutes and about 90% of those hours were billed at $5.48 per hour. I was able to do this mainly because of a secret weapon that I have which is known as Elance.com. I know I’ve mentioned it before, but Elance allows me to have an army of freelancers behind me when you try to get anything done for my website projects. Without it, I would be completely screwed. I saw a slight increase in income this month which was definitely a good thing, but obviously I’m still not where I want to be. Even though I lost a pretty significant amount of money this month, I’m actually happy with the result because I got a ton of work done and feel like I’m making a lot of progress on the projects that I’m working on. Again this month somebody purchased an image (THANKS!) from Shutterstock and I was able to make $9.80 from that purchase. Obviously it isn’t much, but at this point every little bit helps. Next I had some new income, $2.50, from a service called Legalmatch that helps connect people with lawyers. I put this particular affiliate link on a few of my more popular articles where people could use legal help and it’s paying off. After that, I had another income source of $1.92 pop-up which is Google AdSense. For those who don’t know, Google AdSense is the platform that you can use to host Google ads on your website. Obviously this income wasn’t from the OneHourProfessor.com website, but instead it was from the first website I ever made which is www.UnemploymentUnderground.com. You can see that I also made $0.59 from Indeed.com because some individuals that visited that same website must have done a job search and clicked on some type of sponsor job listing. The first of my expenses this month were from the Aweber platform which provided me with $5.70 in profit, but cost me $19.00 in order to keep my account open. Although it’s a bit of a loss, I’m happy that it did provide some income. Next, you may notice that I no longer have Buffer listed as the service that I use for social media management, there’s a reason for that. Although I like the simplicity of Buffer and especially like the fact that it was incredibly quick and got things done with the click of a button, it didn’t have the social monitoring capabilities that I would’ve liked and it was missing the ability to bulk schedule posts across various social media networks. Because Twitter is sending over a decent amount of traffic, I decided that I want to go with something else that was more accommodating for what I really needed. Because of this, I decided to use Hootsuite and have been pleasantly surprise with how effective it is. I’m working on putting together a post explaining my new Twitter strategy and showing you the results that I’m seeing from my efforts. In that post, my goal is to also provide a template you can use within Hootsuite that allows you to very quickly and easily schedule up all of your Twitter posts for an entire month at a time. At $5.48 per hour, a video editor in India who I now submit all of my recordings to and he creates the videos for me. At $5.48 per hour, a virtual assistant in the Philippines who is doing numerous one-off projects for me around research and data compilation. At $5.48 per hour, a writer in the United States who is surprisingly very high quality that helps me write most of the content for my first niche website, which just so happens to be a 90% outsourced niche website experiment. Although my website developer is a little pricey compared to the others, he is substantially less than quality programmers in the United States and I have a long-standing relationship with him. With that being said, I promised him that I would throw him a bone this month and let him know about any people who need a website designed as I’m sure that he can complete it for you. So, if you need a website designed, contact me and let me know so I can relay the message. Next on the list is Facebook which I spent a meager $7.18 on to promote my September income report. Obviously the expense wasn’t crazy, but I wanted to see how far it went in providing more views and I wasn’t disappointed. I think that each month when I release one of these income reports I’ll throw upwards of $20 into promoting a post so that I can get some more eyes on it. A pretty decent expense this month, $102.73, was Google Adwords which occurred because I’m stubborn. When I was writing about my failed YouTube advertising experiment post, I was analyzing what I had done and thought that maybe there was a way that I could improve my result. Really, all it came down to was creating a clickable annotation in the video which would lead directly back to the website. As crazy as it sounds, I didn’t do that in my first run of the YouTube video because I thought it was too intrusive. So, I decided give it a shot again and this time I promised myself that I wouldn’t pull down the advertisement until it spent the full $100 because if I had one conversion in Hostgator, the ad would have paid for itself. Well, the conversion never happened and I ended up spending $102.73 on a video which probably could’ve sat there instead. Aside from that, I have my recurring monthly expenses which are the Long Tail Pro keyword research tool that helps me determine what keywords to focus on with my blog, niche websites and video quicktips, and the Outbrain content platform which delivers traffic to my website at about $0.03 per click. This was definitely a big fat failure this month, but I did make a lot of progress. I am going to put some of the blame on the tech issues that I had as I felt like that really slowed my momentum, but now that I have a game plan and a video editor in place I feel confident that I can get this done relatively quickly. Not only did I select a writer for this, but I was able to get about 70% of the main website content up. My writer is unbelievable because she lives in the US and only costs $5.48 per hour. I’m ecstatic that I found her and very hopeful that she will continue to work with me for as long as I need her. Similar to my second goal in October, not only did I investigate how to create a course on Udemy, but I’ve actually started to create a course and have figured out a way to make money while also providing my members with free access to the courses that I post on that platform. It’s going to be pretty awesome once I get it done and it will also provide me with a revenue stream. Finish the Internet Marketing 101 course redesign that is only available to those that create an account on my website. I know that I wanted to use this in October, and I apologize for not being done yet, but I really want to give my followers something great and I think that I finally have the resources I need to make that happen. Finish the structural content of my 90% outsourced website and get at least four blog posts up so that I can officially launch. Set up a course correctly in Udemy and find a way to give free access to all OHP members while making the general public pay for the course. There you have it, a terrible month by my own standards but definitely one that is creating more building blocks for my plans in the future. What are your thoughts on what I did this month? Think I am wasting money on anything in my expenses? Or, should I add a product to my repertoire? Let me know in the comments! OMG! Ron, you are very good at what you do, but you need to relax a little. ! I’m confident it’ll work out…..just give me another month or two haha. Spend will be reduced drastically in November, this month was a building block. Very detailed report Ron – keep up the hard work and kudos for showing a loss! I like the way you report your income. I wish you success in your businesses. I hope you are pursuing your goals? Hello Oloyede and thank you for chiming in! I appreciate the well wishes and yes, I am continuing to pursue all of my goals. Just visit your blog for the first time today and immediately click on the income report lol. This is definitely the longest report I’ve ever seen. Keep up the hard work man! One suggestion: Try to increase the font size or break up paragraphs into sentences as it’s hard to read a wall of text. Hey Tung, thanks for visiting! I already increased that font size twice, haha. But the spacing is definitely something I will look into. Thanks for checking out OHP though and the feedback. Nice my dude. Loving the transparency as well! Think of this month as a building block to something bigger and better next month. Anyone knows anything about business, taking a loss is sometimes needed to grow a profitable business. Along with failing comes with valuable lessons learned. Keep on keeping on my man, your headed straight to the top! I completely agree with you. This month is definitely more of a building block and I am VERY confident that it will pay off in the future. We will see how the new niche website starts performing, but I think it will go well. It will man, just a matter of time. Keep moving forward, you got this! Love the report though, and I definitely agree that you weren’t losing money, you were investing. I had that a lot too initially. Pouring any income you earn back into the business will only increase that income in the long run. Thanks for the comment! So far I have gotten two commissions paid from Hostgator (One that will be in Novembers income report) and I think BH may convert better because they flat out do a better job with conversion optimization. With that being said, I am going to stay true to Hostgator as I personally feel it is a better option for my readers and that is what is most important to me. Yea, the whole “losing money” thing isn’t really true it all. It is more like I was investing. What is your website? Yeah I guess at the end of the day you have to think which one is better for your audience. Mine kept telling me they’d heard bad things about HG and I got fed up with telling them otherwise. BH does have a few too many upsells though. Yea, but hey….if BH converts better maybe one day I will switch hosting for other websites to it. By the way, love your website. Inspired by Adsense Flippers/Empire flippers? Not directly inspired by them, I actually started the site before I discovered them. They’ve been a big influence over the past few months and sent some traffic my way as well though. Fantastic guys and worth being inspired by. Hi Ron, this is a GREAT report! I found this on the Mastery. I always admire transparency. I got to Dave’s blog back then because of his income report. Love how you added time tracking, too. Can’t wait to see how this goes! Pretty sure it’ll be sooner rather than later with your mindset and work ethic. Keep up the great work! For some reason I am just now seeing this, but I appreciate the positive encouragement! Much like you, I put up sites and try my best to get them to make money. Whether it’s affiliate marketing, partnering with an offline company (then starting my own brand online so i can completely outsource to them) or the plain, old fashioned ecom sites. Im also trying to blog on our site but I just can’t be consistent enough. Ill need a lot of work on that end lol. Nice report. Growing a website is always a process, but I think your investment will definitely pay for itself over time. Seem to be on the right track. btw, you seem to have an issue with the sumo me bar at the bottom. Overlaps with your free resources tab (tried to screenshot it, but didn’t have any joy for some reason). Thanks for the encouraging words! The Sumo bar issue has been resolved for the time being, I stopped it. I will bring it back in the future, but have a few programmatic things I need to deal with.